Benji's Broken Heart: Swinging the afternoon away. Benji enjoying his new swing. Having a little difficulty getting used to it as it requires him to use those core muscles that are weak with him. Hopefully by the end of summer he will have it down pat. 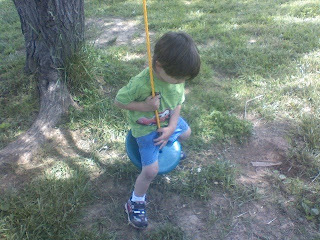 He is taking turns between the swing and the mini-trampoline.